Originally, Grani was an ark created by the "Monster Maker" team in order to bring the Tamers back to the real world. However, technical problems occurred because of which the Tamers started talking to it since Guilmon was convinced that Grani has a conscience. Due to this, the children were able to return safely. At the end of Digimon Tamers, Grani was redesigned so that it was able to compete in battle against D-Reaper. It was mainly used by Dukemon which otherwise would not have been able to fly. 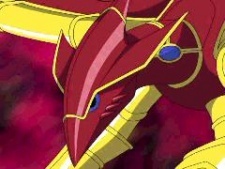 In one of the last episodes, it also fuses with the aforementioned Digimon, thus creating Dukemon Crimson Mode. It makes another appearance in Digimon Xros Wars: Toki wo Kakeru Shounen Huntertachi, joining forces with the Legendary Heroes and fusing with Dukemon once again, in order to fight against Quartzmon and the Digimon it created.